Monday May 26, 2014. That was the day I truly knew, I was capable of living the life ahead of me-whatever I wanted that to be. It was the day I was fitted with my first prosthetic leg. It was the day I took my first steps on the leg. It was the day I got back into a pool. It was the day I took time to wear make up again. Needless to say, it was a busy day. Two months earlier I was in an accident. Even now, fours years later, I don’t remember anything about the night it happened. I woke from a coma a week later to be told by my parents that I had fallen from a 5th floor balcony. I still didn’t remember. I heard their words but they didn’t belong to me. It wasn’t my story. Due to my lack of memory and tests that couldn’t be conducted considering the state I arrived in hospital they suspected my drink had been spiked. I had somehow survived the fall. My jaw was broken in two places, that had saved my brain. And my right foot had, in the surgeons words, ‘been obliterated’, which had saved my spine from damage. I went on to have 8 surgeries, including a final below knee amputation. Of course this accident was devastating. I was 19 and three weeks into my bachelor of social work living in Melbourne with friends. And now I was watching the world go on through a window from a hospital bed. Although, I always felt grateful. I had fallen almost 25m and was alive. Yes, my leg had been amputated but I knew limbs were replaceable. Other body parts are not. There were days where I struggled with what had happened to me, especially understanding why and how when I couldn’t remember. Looking at my new body I knew one thing. My leg wasn’t growing back. And focusing on things out of my control like the how and why, or the who, would not bring it back. Finding answers to those questions wouldn’t change what had happened, and I decided to focus my energy on things I could change. My recovery. I was in hospital for six weeks and received a total of eight operations. My family never left my side and the best of my friends made themselves known as they would always visit…and bring me decent food! I was quickly bored with sitting in bed all day and longed to be back outside living life. I made a mental note to remember this feeling of inability. I knew I would recover and one day be up on my feet again, and if I ever felt lazy or wanted to stay in bed, I told myself I would remember the days where I had no choice but to be in bed. And how much I hated it. This taught me to be grateful for my body, and that it was my duty to use it the best of its ability - whatever that would be. While I was in hospital I met Mike Rolls, a bilateral below the knee amputee from an organization called Limbs 4 Life. My mother has told him that was a swimmer for 12 years so he promptly mentioned that he used two ‘prosthetic fins’ and threw out the idea of me having a ‘mermaid leg’. I spun round to mum and exclaimed ‘I’m going to be a mermaid!’. In that moment, even though it was in the back of my mind, I knew swimming would be apart of my future. I have always dreamt of being a mermaid. I received my first prosthetic one month after my final below knee amputation (BKA). I had initially only had a partial foot amputation and the decision for a BKA was for greater mobility. To me that was a easy decision. The moment I stood and took my first steps, I knew I had made the right decision. I was in rehab for seven weeks and by the time I walked out those hospital doors I had already discovered limitations of my prosthetic. I could only wear one pair of running shoes comfortably, and they definitely did not match most of my wardrobe. Sandals were out. So were high heels. It was the little things like shoes that upset me more than my limitations surrounding walking. Not being able to walk long distances or unaided was annoying, but I could swim. And I was swimming everyday. So mobility wise, as long as I could swim I was happy. Ive always been a water animal anyway. After a few months later I had worn out my first food. I had been complaining about the inability to wear different shoes so my next food had an adjustable ankle component. It was a small adjustment, I could wear maybe 2cm heels but it was something. I was swimming with a swim club at this stage and had just qualified for the International Paralympic Committee Swimming World Championships, only one year post accident. My training had increased in the water, as had my gym. The new foot lasted six months. Most prosthetics are not water proof, and even though I don’t swim with my leg on it was always around the pool and naturally got wet, a lot. During this time, since my leg had finally stopped loosing volume and was at a stable shape, we started talking about making my ‘mermaid leg’. My prosthetics department were excited to work on a different project and I was keen to have something help benefit my swimming. The creation was innovative and I got to see it being made each time I visited the clinic. They covered the socket in shiny mermaid scale material and attached a bright green slipper to the end. The afternoon I got the leg I didn’t have training, but I went straight to the pool regardless. It was a bittersweet moment when I got in the water with the fin for the first time. Swimming down the pool, for a brief moment, I felt like I had two legs again. The fin was very heavy in the water but the shiny scales made me feel beautiful. I was mermaid and I stayed in the water just kicking around underwater as long as my lungs would allow. I used my new fin in training to help activate the muscles in my short leg- they had not been used in a very long time! Due to the wait of the fin I didn’t swim faster, but I loved the challenge of trying to. The fin helped develop better balance in the water and engage muscles that had stopped working due to not using my right leg. After some fundraising and research I was ready to purchase the feet of my choice. I decided on two separate legs. One from a company called “Rush”. They made ‘all terrain’ carbon fiber feet. They were 100% waterproof-the selling point for me. When it arrived for the 30 day trial, it felt like I was bouncing on a spring! I loved it. This leg has seen me rock climb, hike national parks, swim in waterfalls, stand-up paddle board, sail, ride bikes, jog (not quite a run yet) attempt inflatable obstacle courses, the list is endless. This leg is capable of almost everything - cept wiggling its toes! The second foot was from ‘Freedom Innovations’. With it, I could wear heels. And real heels. I had kept a few of my favorite high heels in the back of my room and when I took the freedom foot home I rushed to try them on. I still remember the first pair I could stand in. I felt so tall, towering above the ground shaking through my legs, arms out ready to brace if I fell. Tears welled up in my eyes. Something so small meant the world to me. Doors that seemed closed no longer were. It took a while to get the balance of walking in heels back but I was happy to practice. The other great thing about the Freedom foot was that there was a split between the big toe and the second. So I could wear sandals. I could go shoe shopping and buy something other than running shoes! It was two years post accident before I had these legs, and before I could use them simultaneously. Prosthetics are expensive and we had to be sure my limb was healed, stable and ready to handle the legs. Being able to spend so much time in the water training (where I didn’t wear a leg) helped time go by. Whenever I was frustrated with the limitations of earlier legs I could escape in the water, a place I had full freedom and mobility. Although I contribute financially to my legs I know I am extremely lucky to have access to and own as many as I do. As a university student studying Social Work I have the goal of working to deliver disability aids and prosthetics to developing countries who don’t have the same access. It is 2018 now and I still wear my Rush foot and Freedom one. I am in my Rush 80% of the time as I find it the most comfortable for walking, training and gym. I wear my Freedom on weekends, for certain shoes or for formal occasions. In an attempt to keep my prosthesis interesting I have covered the socket of my Rush leg in blackboard spray paint. This means I can use chalk pens to draw new designs whenever I want. I’ve always wanted some artwork on my leg but have never been able to settle on a single design. The blackboard leg means my leg can change as often as my mind does! I also have a few leg covers from Alleles Design Studio including a ‘Australian’ themed cover I wore at the Paralympic games in Rio 2016. These covers are fantastic as they simply clip over the top of my make my leg stand out with their loud, bright designs. Initially my prosthetic had a foam cover so it resembled a ‘human leg’. I wasn’t ashamed of being a amputee I just wanted my normal life. 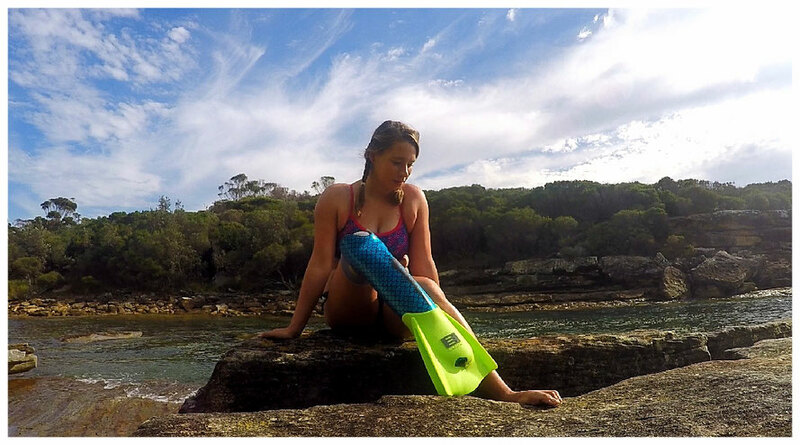 There is nothing normal about being an amputee and through my return to swimming I began to embrace this, and changed to the ‘bionic’ look. The Alleles covers help me show off my prosthesis even more, showing the world how proud I am to be who I am. Four years after my accident I am a Australian Paralympic Silver Medalist. I love my life and who I am, prosthetic and all. Now that my body is stronger out of the water I am reaching the limitations of my Rush foot. One day, I’d love to try a running blade and absolutely hope to have a cycling leg. As I get stronger I will keep pushing the limits of my bodies ability, but for now until Tokyo 2020 Paralympic games, you’ll find my happy and content swimming laps in the pool. Guest post by Monique Murphy. Monique is a below knee amputee who lost her leg in a tragic accident. 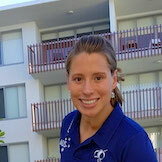 She soon re-discovered her love for swimming and is a member of the Australian Paralympic team. To learn more about her, visit her homepage or follow her on Instagram and Twitter.